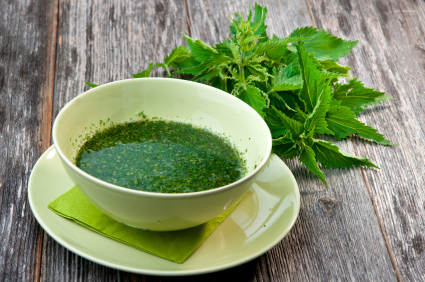 If you're just joining this series, don't miss Stinging Nettle Part 1: What It Is and Its Health Benefits! 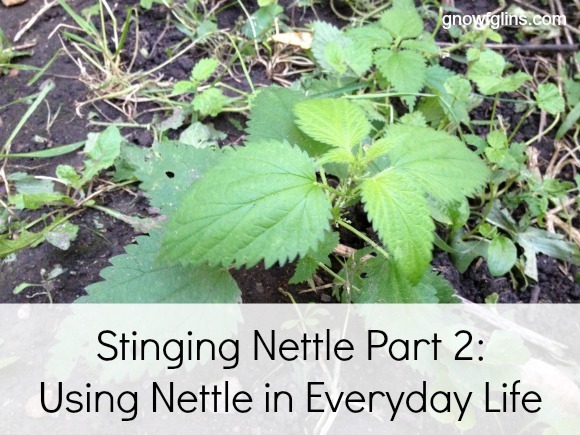 I covered how stinging nettle has been used in times past for ailments such as excessive menstruation, pneumonia, asthma, sciatica, arthritic joints, and lumbago pain. In today's Part 2, I'm going to give you some ideas how you can use this useful herb in your kitchen. 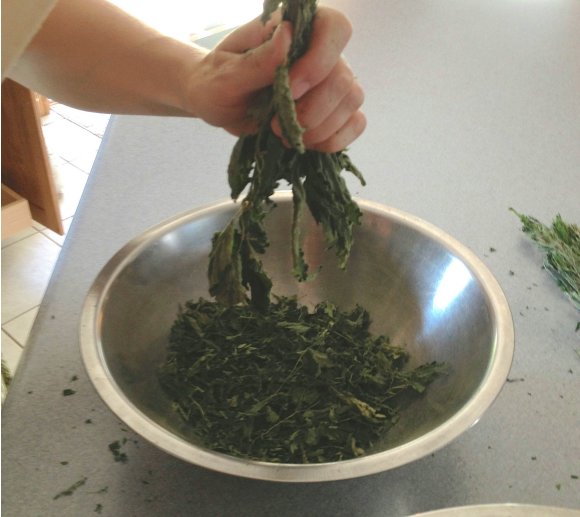 You can purchase dry nettle leaves or I'll show you how to gather your own and dry them at home. When you forage for nettles, watch for leaves that are long and toothed with beautiful veins running toward the tip of each tooth. The little stinging hairs we all love to hate cover the main stem, leaf stems (petiole) and tops of the leaves. Samuel Thayer, author of The Forager's Harvest, explains that it's possible to pick these herbs by looking at the direction the little hairs lean on the stem. Generally they point toward the top of the plant so if you grasp the stem and pull up with your fingers, you'll receive less stings than if you just grabbed it and let your fingers move back and forth on the stem. Right away I'm going to burst your hopeful bubble with a stinging nettle hair, and tell you that you most likely will get stung. You can wear gloves, but unless you're covered from head to toe in long sleeves and pants, every time you come across a nettle you decide to pick, you will get stung. But the good news is, the juice of the nettle is its own antidote. Apply it for instant relief. Cool beans, huh? 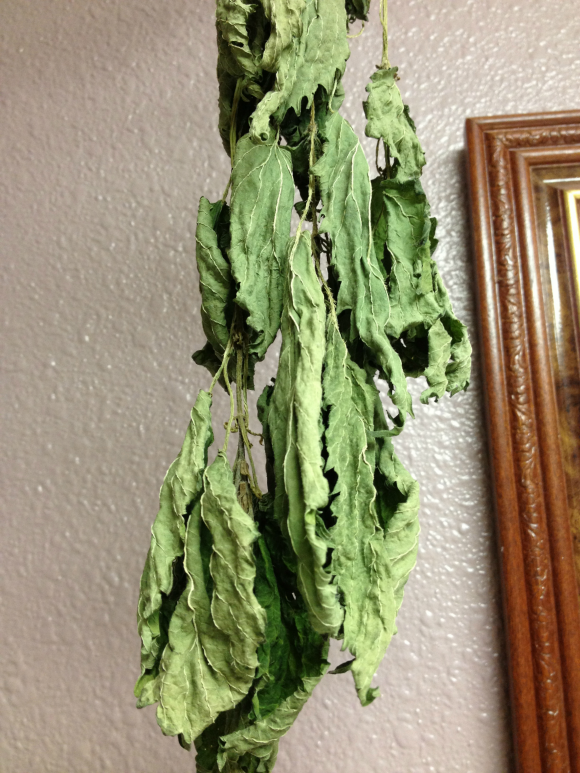 One of my favorite ways to use nettles is when they've been dried. Once you pick them, you'll want to hang them upside down. 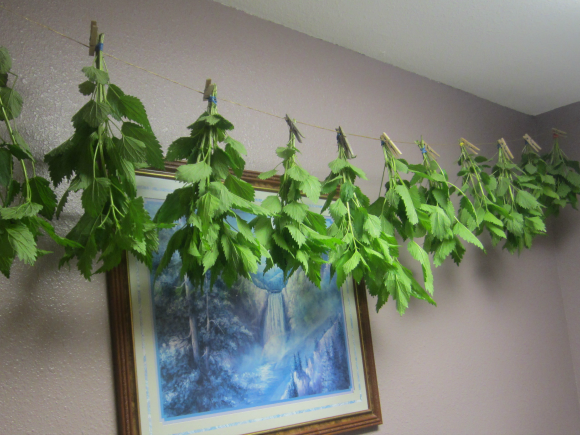 We wrapped four or five plants together with a rubber band and hung them on a drying line across our laundry room. Space them so there is enough airflow — if they're crammed too close you can get moldy leaves. It doesn't matter if there are a few stems in there. It's all good. Store the leaves in a ziplock bag in a cool, dark cupboard — but keep them handy because you're going to use them! Combine dried herbs and store in air tight jar or container. To make hot tea, pour boiling water over 1 to 2 teaspoons of the tea mix. Let it steep for about 5 minutes. Remove the leaves and sweeten with stevia or another natural sweetener. To make a big batch of cold tea (my favorite), pour about 4 cups of water over 1/2 cup of leaves. Let steep for about 4 hours. Shared with permission from eBook Will Forage for Soup by Fresh Bites Daily. Heat the broth to a simmer in a large soup pot. While the broth is heating, saute the onion and garlic in the oil using a medium skillet. When the broth comes to a simmer, add the sauteed vegetables and the nettle leaves. Gently stir the soup for about two minutes. Turn off the heat and allow the soup to rest for 10 minutes before serving it. Taste for salt and pepper. Make necessary adjustments. So there you have it — a healthy dose of beneficial greens in two easy-to-make recipes. To your health! Do you eat nettles? What are your favorite recipes and what have nettles done for YOU? Paula is a homeschooling mom of six. Several family health issues involving candida, food allergies, and Lyme Disease have created a passion to understand how our God-created bodies thrive or deteriorate based on what we put in them. She is a Certified Health Specialist and Level 3 Metabolic Effect Nutritional Consultant who coaches those with recurring candida and stubborn fat to heal their gut and shrink their waist at Whole Intentions.com. You can touch base with her on Facebook, Pinterest, and Youtube. I just got done processing the results of our nettle foraging expediton today. I made a 2- gallon batch of nettle “beer”, 2 batches of nettle pasta, 2 batches of nettle pesto, and still had enough to fill 4 screens for drying. 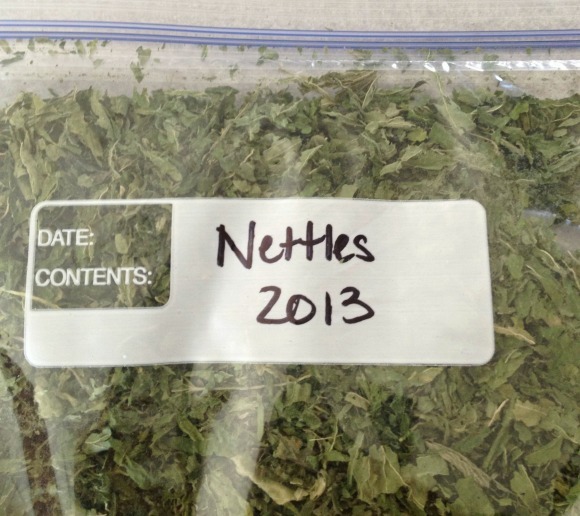 We drink nettle infusions about 4-5 days a week, so the dried will not last long. 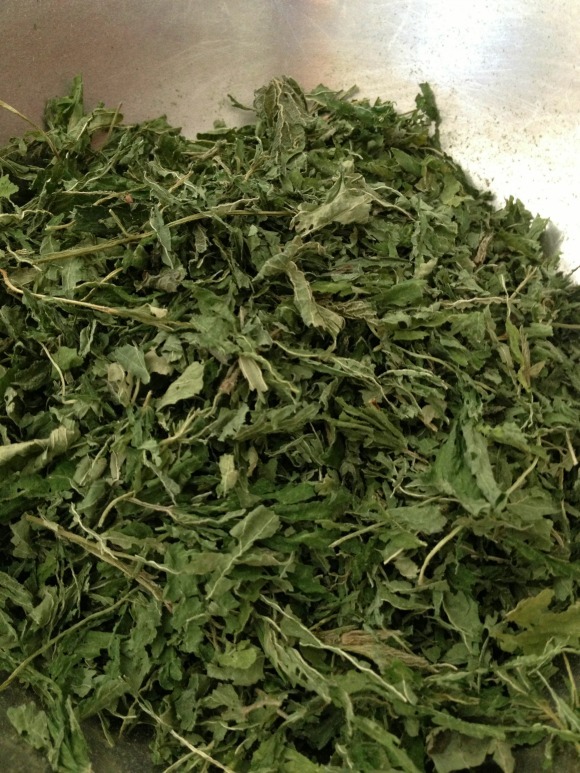 Nettle is high in magnesium and calcium and has a fair bit of protein as well. Taking tea or tincture of nettle can help ease environmental allergies. What about being pregnant and drinking this tea? Should proportions be adjusted or something substituted? ….now 4 months along in a first-time Mom. ~ Thanks for all you do & share!! !